I don't know how much I can accompolish in my volunteering, but I want to start the change from me, as an individual. Stop planning for each step carefully for a career, stop wishing the wish all the time. While many people question my motivation to go volunteering in an organic farm, this video undoubtedly strengthens my belief in my action. 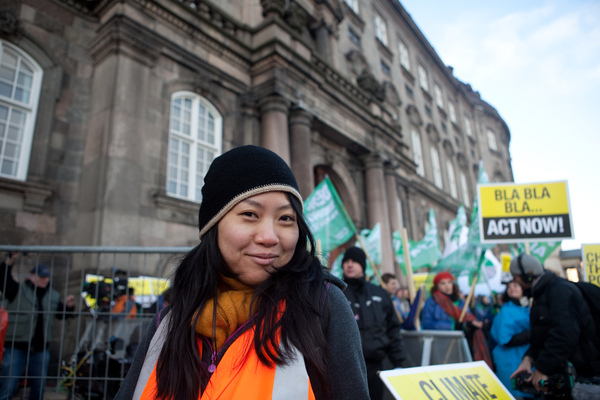 Last weekend, I joined Friends of the Earth Int'l as a steward in our action for COP15. Couple weeks ago i met Anna from a swing dance floor. The lovely australian girl told me that she's going to lead 350 people to dance Charleston in the mesuenplein on 24 OCT. I was planning for being part of the 350, alas, it seems like I might be travelling in Germany at that time. www.350.org provides me more information of what I can do if I end up in cities outside Amsterdam. I see a global wave of self-organization for the concern of climate change. Many years ago Petra Kelly referred to Joanna Macy and said that the primary goal of Green politics is an inner revolution, it is "the greening of the self." Yet in our current 2009, the revolution is no more inner and self. Part of the reason is because of the Internet, and the other part reflects a sad fact that climate change is no more consciousness but already a crisis now. How can the Internet help turn information into actions? That's sth I am attempting to know and do more.